Calling Intermediate & Advanced Leaders! 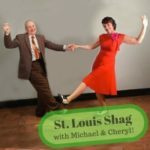 We need 4 more Leaders to join and help balance out our 7PM St. Louis Shag class that starts tonight with teachers Michael Marangio and Cheryl McBride! Come out and dance with all the followers excited to learn with you! Register online now and save $5 vs. at the door!